K-Seal will permanently repair most cylinder head cracks or leaks. Just shake, pour & go! What Are The Symptoms of Cylinder Head Failure? The symptoms of cylinder head failure are varied – it is important that drivers are able to recognise them as quickly as possible so any damage can be limited. If the cylinder head fails, it will lead to the engine (and by extension the vehicle) breaking down. The most common reason for cylinder head failure is overheating caused by coolant loss, head gasket failure or restricted flow of coolant. In extreme cases a cracked or damaged cylinder head can result in terminal damage to the entire engine. How Much Will Cylinder Head Repair Cost at a Garage? A good garage should be able to repair and recondition a cylinder head from as little as $75, but it can also cost hundreds of dollars to do the same job. This will depend on the value of the cylinder head and the price you are quoted to repair it if it develops a crack or stops working as effectively as it should. In many cases, it may be worth simply buying a new one. Can K-Seal Fix My Cylinder Head? K-Seal will permanently repair most cracks or leaks in the cylinder head where there is coolant loss. You simply shake the bottle, pour and go! Want to get hold of a bottle to fix your cylinder head? Use our simple stockist search facility and get back on the road – fast. A cylinder head sits on top of the engine block and covers its cylinders, thus creating the combustion chamber. The cylinder head creates the space for the passages that feed air and fuel to the cylinders, and is sealed in place by the head gasket. Due to constantly changing temperatures and high pressure levels, the head has to be robust enough to withstand the demands placed on it without cracking or breaking. It is a complicated and vital part of the engine and vehicle as a whole, meaning that any problem it might develop should be repaired as quickly as possible. The cylinder head allows the engine to perform at maximum capacity by connecting to the intake and exhaust manifolds to allow the quick burn of fuel and air that moves the engine’s pistons. The intake manifold feeds air into the head, where it is combusted with fuel to produce exhaust gases, which are expelled through the exhaust manifold. It’s important that the intake and exhaust valves, which allow the entry and exit of relevant gases, open and close at the correct times to keep the engine running smoothly. Why Do Cylinder Heads Fail? The most common reason for cylinder head failure is overheating caused by, for example, coolant loss, head gasket failure or restricted flow of coolant. In extreme cases a cracked or damaged cylinder head can result in terminal damage to the entire engine! You must deal with any problems as soon as possible to try and prevent this from happening. Cylinder heads can also warp because of the tremendous pressure placed on them by extreme temperature changes. This means that it is no longer providing a flat surface to hold the head gasket in the right position, which can lead to expensive problems later on in the form of major repairs or total engine replacement being required. Warping is a particular problem for cylinder heads made of aluminium. Different engines have different levels of tolerance for cylinder head warping – some can withstand a high amount of warping while still working effectively. If your cylinder head does warp, you may be able to take it to a mechanic who specialises in realigning them – if not, you will probably need a replacement. 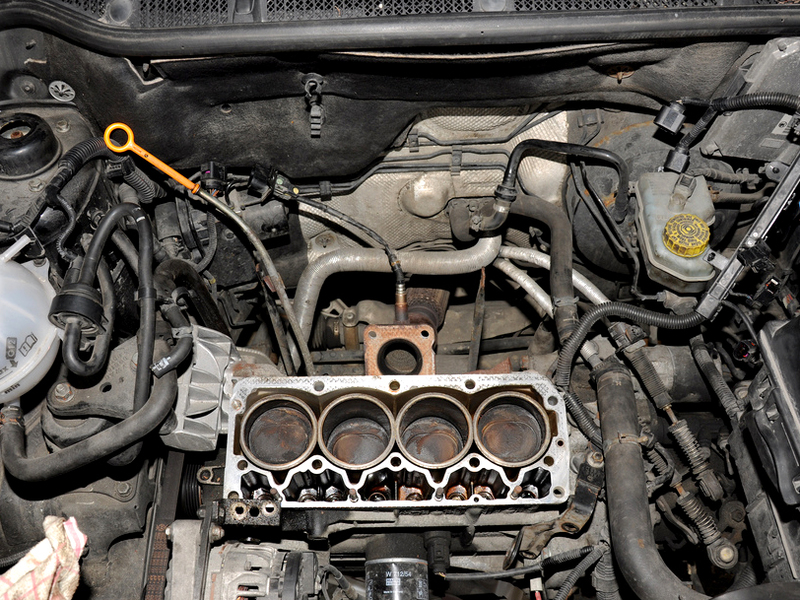 Your cylinder head isn’t the only part of your engine that might be suffering. Select an engine part in the interactive diagram below to explore your engine and the important components that keep everything ticking over.